This map contains territory of Belgium, of Germany, of Luxembourg, of Netherlands. large city Koeln presented. large city Frankfurt am Main free download. large city Essen marked. large city Dortmund for Garmin. You can find here large city Dusseldorf marked. On this map large city Duisburg for Garmin. city Bochum for Garmin. city Bochum-Hordel download for free. 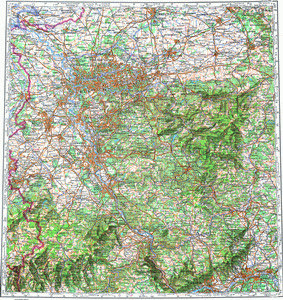 On this map city Wuppertal presented. On this map city Bonn marked. You can find here city Wiesbaden download for free. On this map city Muenster presented. Displayed city Gelsenkirchen marked. You can find here city Aachen download for free. city Monchengladbach for Garmin. Displayed city Krefeld download for free. On this map city Oberhausen presented.